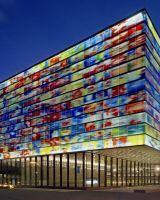 Welcome to Media Park, the media heart of the Netherlands, where traditional and digital media connect seamlessly. Enthusiastic start-ups work shoulder-to-shoulder with professional media companies and major broadcasters. No less than 6,000 media professionals, specialists, creative individuals, presenters, technicians, enthusiasts and visionaries work together to produce what we see and hear in the media each day. Together, they form a lively, professional community that drives and brings life to the park. The Media Park offers a pleasant and productive working environment and does everything to accommodate and facilitate its tenants’ needs and requirements. We do so through providing personal, professional service, offering state-of-the-art technology and resources, modern facilities and an extensive range of exciting activities and events. All of this is available within the pleasing green surroundings of Hilversum. 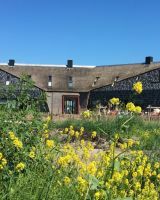 Green, well organised, safe and sustainable – the Arena Park is the office location in the Gooi & Vechtstreek region. Its position close to the Hilversum (A27) exit, next to the Hilversum Sport Park railway station and along several high-frequency bus routes makes this location highly accessible in every way. The cities of Amsterdam, Utrecht, Almere and Amersfoort are all within 20 to 25 minutes by car. 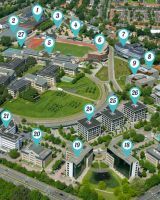 Companies such as Rabobank, the NCOI training institute, Nike, Converse, SLTN and Regus have all been located in the Arena Park since its early days. In combination with other functions such as Hilversum’s MBO College, the Optisport sports school and the athletics track of the Gooische Atletiek Club – complete with historic Dudok grandstand from the 1928 Olympic Games - the park is truly unique in the Netherlands. Cooperation is excellent between the tenants and owners of the properties within the Arena Park. This has even earned the park certification on the basis of the Keurmerk Veilig Ondernemen (KVO) quality stamp for safe business. A limited number of parcels are currently available within the park offering a total gross floor area of 95,000 m2 for offices. The area situated between the A27 motorway and the ‘De Blaricummermeent’ residential area is intended to serve businesses wanting to establish themselves at a prime location. Just beyond the busy Randstad conurbation, yet still in the heart of the country and, more importantly, incredibly easy to access. Not only is the area easy to access from the motorway, BusinessPark27’s business climate also makes it a top-quality business park. For Blaricum Municipality, BusinessPark27 sets a new standard in architecture, facilities and strategic setup. BusinessPark27 is an amazing place to work for creative professionals, service providers, production companies and businesses with warehouse facilities, within campus-like settings boasting excellent parking facilities on their grounds. An inspiring mix of different kinds of companies and business premises of all shapes and sizes.